As you all know...if you are pregnant or nursing it is best to avoid alcohol. With that said, there is nothing wrong with indulging in a few delicious mocktails while pregnant or nursing a new baby. 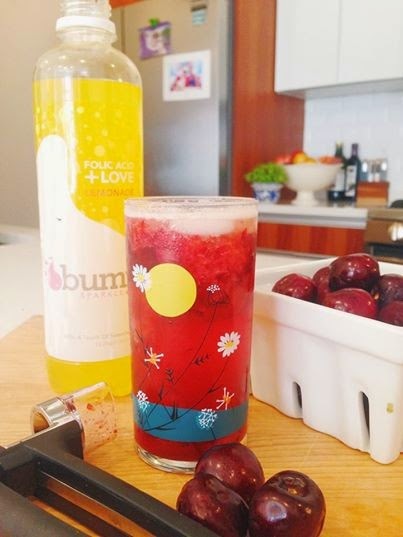 Bump Water, a beverage with 100% of the recommended daily amounts of Vitamin A, Vitamin B6, Vitamin B12, Vitamin D, Vitamin E, Calcium, Niacin, Biotin, Zinc, Magnesium that are found in prenatal vitamins. Now Moms-to-be can indulge in refreshing cool drinks, all while getting their dose of the vitamins needed for their little one! 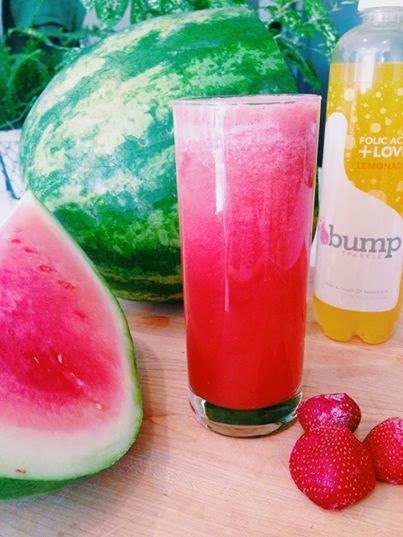 In a blender, combine three frozen strawberries + ½ cup of summer ripe watermelon + ¼ cup of Bump Water Lemonade Sparkle. Pour into a glass and top with Lemonade Sparkle. Select 5 -6 ripe cherries, remove the seeds and in a tall glass give them a little smash with a muddler or end of a cooking spoon (tough day? then keep on smashing!) Top with Bump Water Lemonade Sparkle. Our Thoughts: My daughter is early on in her pregnancy and we received 2 bottles of BUMP Water to try out for all of you. She received a bottle of the Lemonade and a bottle of the Cranberry Ginger. She loves sparkling waters and was pretty excited to try out this particular brand. For her personally, she just poured each one into a tall glass filled with ice. It is just the way she prefers to drink them. Both had a really nice flavor but her favorite was definitely the Cranberry Ginger. She really liked that taste of that one and although she liked the lemonade, she thought it was a tad tart for a sensitive tummy like hers. We are going to look in the stores for BUMP Water as she is really interested in trying out a few additional flavors. One of the things she appreciates with these sparkling flavored waters is the fact that they are naturally sweetened with added folic acid & potassium. You can visit the sponsor's web site to learn more about the company and the products that they have to offer.